Located in the heart of the Andrews Recreation and Wellness Center, the bouldering wall continues to test novice climbers and enhance the skills of those with seasoned experience. Youngstown State University hosted a climbing competition on Saturday, mostly designed for beginner climbers. Every semester, YSU hosts its competition, which brings outside students from schools such as Kent State University, Slippery Rock University and West Virginia University. The event included a toy drive and prize giveaways to the top finishers. In total, about 25 climbers participated during the three-hour competition. 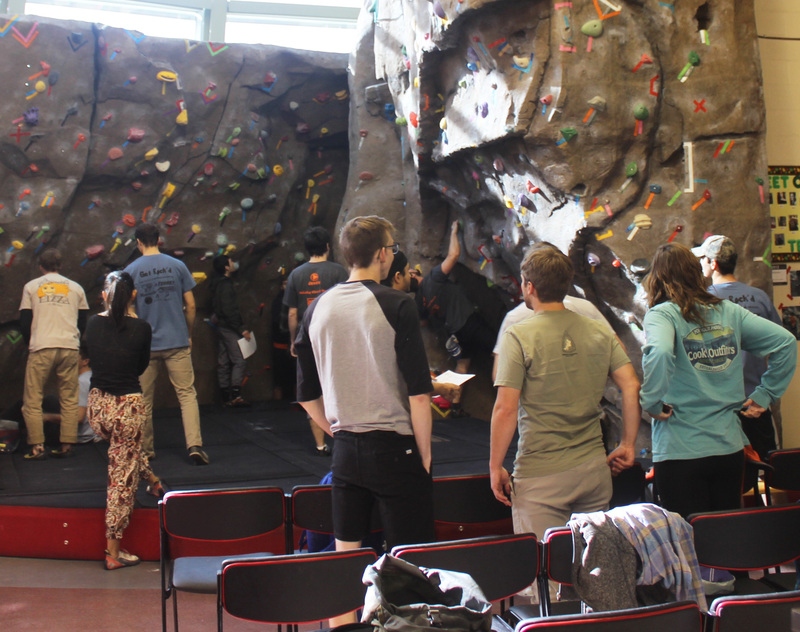 R.J. Markowitz, the adventure recreation coordinator, said the bouldering wall is a critical part of campus recreation success because it offers an unorthodox workout. Markowitz said the addition of the wall allowed for outside interest, as well as an increased number of YSU students attending the rec center. The bouldering wall was added to the rec center several years ago and its addition has allowed YSU to hold several events, such as the competition. Collin Pope, the marketing and program intern for adventure recreation, said the climbing competitions are among his favorite events at the rec. Pope said he handles all marketing for campus recreation, which includes social media updates, Rec Extra, spring break trips and escape rooms. “These events allow competitors to meet each other and have fun. We’re not focused too much on winning as much as we are focused on fostering a new climbing community,” he said. He said the competitions usually cater to beginners. During these competitions, more experienced climbers are given more difficult routes to level the playing field. While the competition is not about winning, creative trophies are handed out. “In years past, we’ve taken old running shoes and spray painted them gold and silver, handing them out as trophies for the top finishers,” Pope said. In general, the small competitions YSU has each semester take a few weeks to plan. According to Markowitz, the event would not be possible without the help of his co-workers. “We look at our staff as a community and they do an incredible job of setting everything up,” Markowitz said. Markowitz added the competitions are managed differently from normal bouldering wall hours, as the events tend to get more technical with routes and numbers. For the Saturday competition, the climbers were mostly comprised of YSU students; however, climbers from other schools were in attendance. Amy Fahringer, a student at Slippery Rock University, attended the competition. For Fahringer, climbing has always been a favorite activity. Fahringer started at a bouldering wall similar to YSU’s, but has since gone outside, where she finds it to be just as thrilling. According to Pope, there are not many climbing spots in the area. The new River Gorge in West Virginia and the Red River Gorge in Kentucky are some popular climbing spots among locals.